Edward Freeman was born at Isleworth in 1875, the son of Harold and Alice Freeman, later of Thorn Bank, Malvern Wells and the grandson of the late E A Freeman, Professor of Modern History, Oxford. He was educated at Uppingham, living in School House and leaving in 1894 to attend Oriel College, Oxford. In 1897 he married Katherine Margurite Gillespie of Gally-Y-Beran, Pwllheli, Carnarvonshire, the only daughter of the late General Gillespie of Brynderwyn, Usk. Major Freeman brought together and trained the Pwllheli Company of Volunteers, of which he was given the Captaincy during the South African War 1899-1902. He was promoted Captain 6th Battalion Royal Welsh Fusiliers in 1900 and Major and 2nd in Command of the 10th Battalion in September 1915. 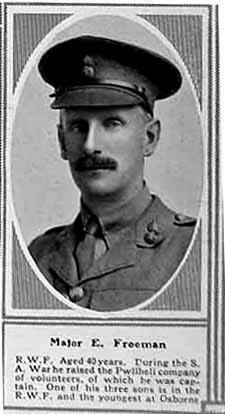 They had three sons and the eldest, Edward Rolly Freeman was also educated at Uppingham from 1914 – 1916 and served with the 3rd Bn, The Royal Welch Fusiliers during the Great War. Another, Harold Freeman, also served with the Royal Welsh Fusiliers and was awarded the Military Cross – he went on active service just months after his father’s death. On the 2nd March 1916, the 10th RWF made a successful attack about a German defensive position known as The Bluff they recaptured the front line and took a small party of Germans. In retaliation, the enemy shelled the area for 24 hours. At 1230 a shell of large calibre made a direct hit on the Battalion Headquarters in Gordon Post and killed the Commanding Officer (Lt Col S S Binney), the second in command (Maj E Freeman) and the Adjutant (Capt W T Lyons). Sometime after the war Katherine Freeman remarried, but remained in Pwllheli. War Diary of the 10th Royal Welch Fusiliers: PRO WO/95 ?